This exotic phacopid trilobite of Family Acastidae comes from the Devonian limestones in trhe Anti-Atlas Mountains of Morocco near Foum Ziguid, where a huge diversity of other trilobites are collected. Some years ago now it was known in the commercially trade as Trident Comura, and was highly sought by collectors. The “trident” trilobite nickname persists today. Recent years have seen trilobite workers expend a huge effort on the trilobites of Morocco, as they are some of the finest to be found, highly diverse, and usually are preserved in life-like three dimensions (as often is the case in limestone as opposed to shale). Walliserops is illustrative of the hard work in Morocco with many publication appearing over the past 15 years. 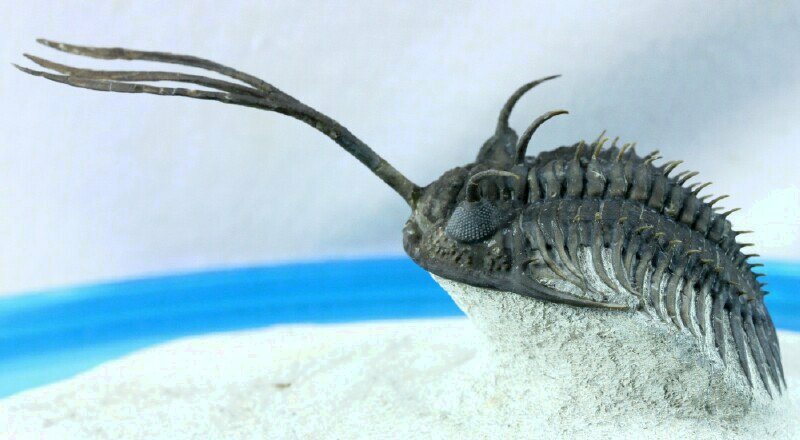 As work proceeded, Morzadec (2001) named the species Walliserops trifurcatus at a time when but one species of walliserops was known. 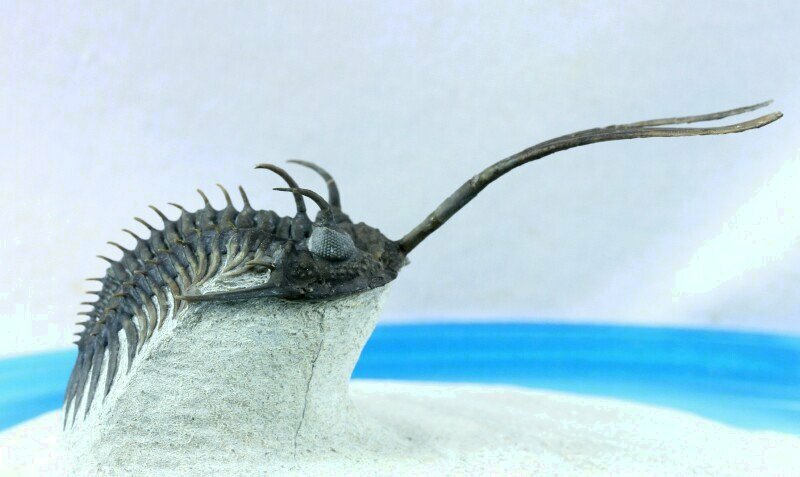 Soon thereafter, Brett and Chatterton (2001) erected the new genus Parabolops, with two species, Parabolops neptunis with a longer trident, and Parabolops hammi, another trident having a shorter forked trident; Morzadec’s work won out and the Walliserops genus name stuck. By the time of Chatterton et al.’s 2006 paper, the long-forked species shown here was named Walliserops trifurcatus, and two shorter-forked species named Walliserops tridens and Walliserops hammi. Other variations of Walliserops have been discovered (e.g., Walliserops lindoei and Walliserops hammi), some as yet undescribed. The trident is unprecedented among more than 20,000 trilobite species, an evolutionary enigma, and a functional mystery. Many hypotheses have been put forth regarding why the adaptation took place and the purpose. The appearance of such a prominent phenotypic trait would ostensibly require considerable “evolutionary energy”, for which some substantial selective advantage would be expected for its possessors. Energy would also be expended to grow, and possibly regrow, the protuberance which might have made shedding its exoskeleton more difficult, and it hardly benefitted the trilobites steamlining. 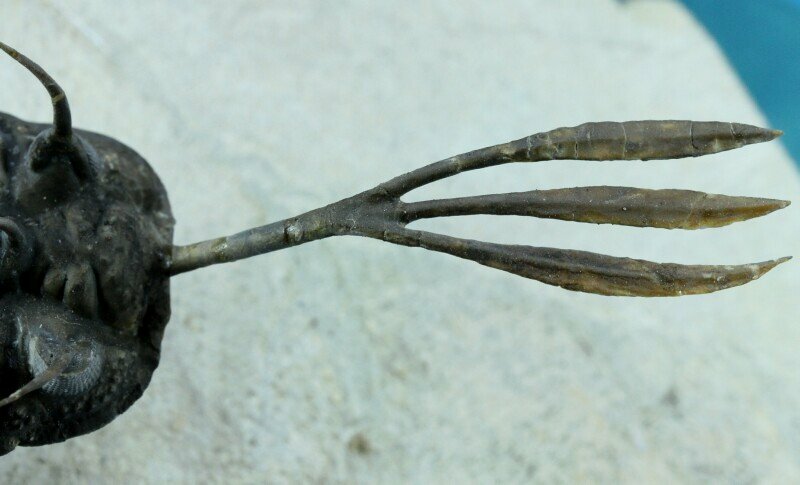 Moreover, the trident itself lacks the bilateral symmetry, curving away from the body axis, and distinctive trait among most animals, arthropods and trilobites. Further, there is variability in the trident curvature, with shorter tridents more curved. Several uses of the trident have been discussed: 1) a means of levitating above the seafloor; 2) sophisticated sensory organ; 3) a mechanism for hiding or defending; 4) a mere adornment of sexually (dimorphic) selection as in the staghorn beetle; 5) sexual or caste polymorphism as in social insects. Of course, a combination is plausible, for example, sexually selected armament. 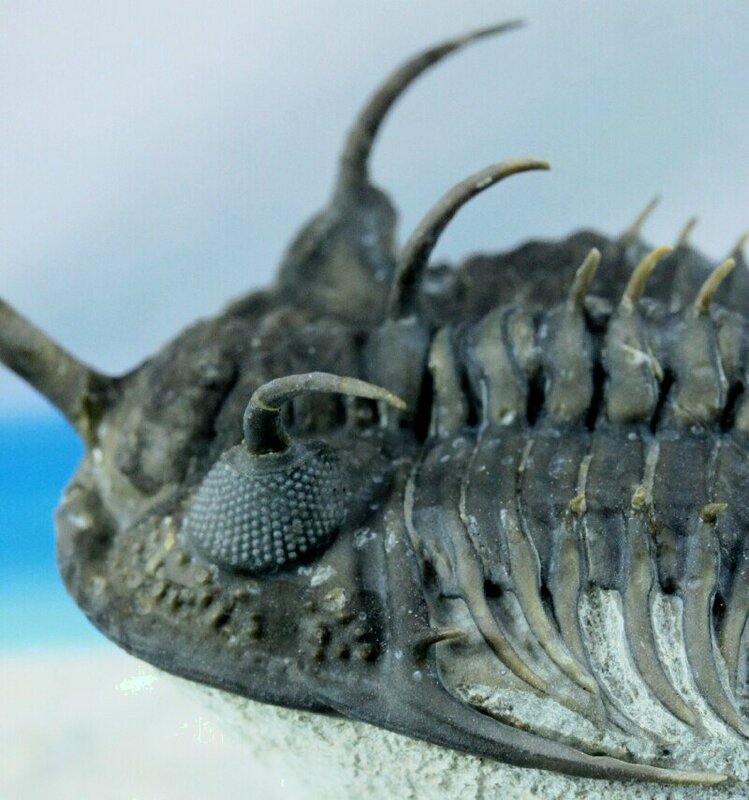 As with many other Devonian trilobites, Walliserops sported an impressive array of more than 50 spines as protection in a sea where predator skills and weapons were also evolving. 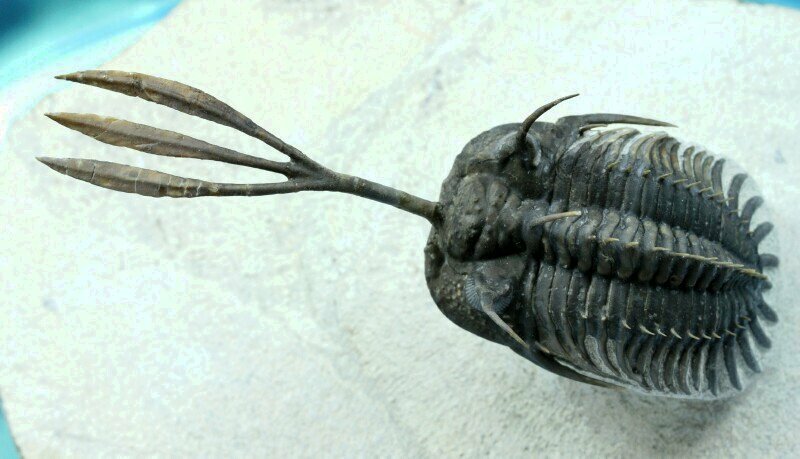 And then, of course, there the trilobite has crystal Schizochroal eyes that were only in trilobites of Order Phacopida, Suborder Phacopina, and which are beautifully preserved in this specimen. Morzadec P (2001). 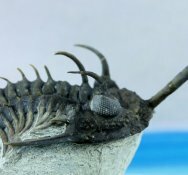 "Les Trilobites Asteropyginae du Dévonien de l'Anti Atlas (Maroc)". Palaeontographica. Abteilung A (in French) 244 (1–3): 53–85. Chatterton, B, Fortey RA, Brett K, Gibb S & McKellar R (2006). Trilobites from the Lower to Middle Devonian Timrhanrhart Formation, Jbel Gara el Zquilma, southern Morocco. Palaeontographica Canadiana 25. Knell RJ & Richard A. Fortey RA (2005). "Trilobite spines and beetle horns: sexual selection in the Palaeozoic?". Biology Letters 1: 196–199.